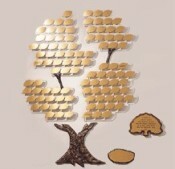 The 200 leaf Growing Tree is perfect for a Capital Campaign and Donor Appreciation. Individual leaves are grouped on plexiglass panels and mounted in clusters. Tree kit comes with a paper template for easy installation, extra leaves, screws, and a screwdriver. 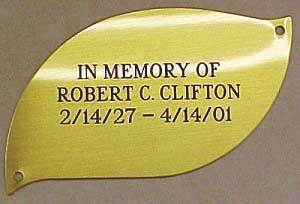 Special engraving rates available for the individual leaf plates. You can purchase the tree online and we can contact you for engraving details. 5 Ft. Wide X 5 Ft High. 200 leaves, six branches and one cast bronze trunk. Small acorns and mini trees seen in the picture are not included, but can be ordered. All trees come with gold plates, but can be ordered with gold, silver, copper and bronze leaves. Contact us to receive our downloadable Donor Tree Guide featuring the Growing Tree, add-ons, and pricing, to take to your group or committee.